Cat® industrial engines are ready for your application. These engines deliver the unsurpassed reliability, durability, fuel efficiency, and low cost of ownership you have come to expect from Caterpillar. With power options from 8.2 to 6,100 bkW (11 to 8,180 bhp), Cat industrial diesel engines offer the widest power range in the industry. Our engines aren’t just powerful, they’re efficient. 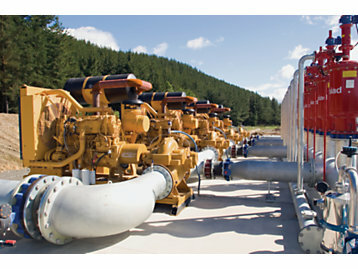 We’ve engineered them to run faster, burn less fuel and maintain maximum uptime, even with regeneration operations. It’s how we’re helping you save while you work and reduce your environmental impact. Whether you’re powering small aerial lifts or massive tub grinders, Cat® Industrial engines offer a broad range of power options and emission solutions to meet your needs. And, they’re easy to install in your existing configuration.